Farfisa Soundmaker digital synthesizer half-page advertisement from page 60 of Contemporary Keyboard Magazine December 1979. I was going to end the blog post there for two reasons. 1. I thought it would be funny (and, for the record, true). 2. So that I could spend the rest of the day playing video games and generally do nothing. This rare half-page advertisement seems to have first showed up in Contemporary Keyboard in the December 1979 issue of CK and then appeared very sporadically over the next year and a half. I've blogged a bit about that December 1979 issue during a Yamaha CS-related ad post because the cover of the mag included a classic photo of Wendy Carlos, together with a great 15+ page interview with her. I've read through that interview a number of times and I can't believe I've never noticed the Soundmaker ad that appeared on one of those pages of text. Or may that was exactly the reason I didn't notice it - too busy reading. Sure enough, it is one pretty-looking beast. Vintage Synth Explorer's Soundmaker page probably has one of the best images available, along with a nice summary of the machine. Till Kopper's Web site also has a pretty good image of the machine, but what makes his Soundmaker page great is the vast amount of reference information he has decided to share online, including lists of all the preset sounds, some operational info (split modes, aftertouch), a bit of technical info, and a peppering of his own subjective observations. According to Hollow Sun's Soundmaker page (created as part of a 'donations' sample collection where users can donate samples to the Zero-G 'Nostalgia' virtual sound module), the "obscure" instrument wasn't that successful "stacked up against the Prophet 5, the Oberheim OBs and, of course, other string synth hybrids such as the ARP Omni", and that Farfisa "lacked the clout to promote the product aggressively in a highly competitive market". I have to agree. 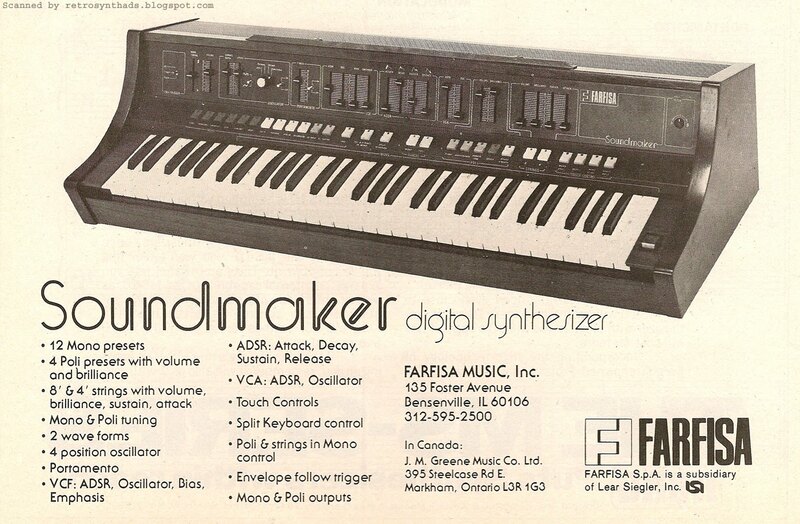 As far as I can tell, Farfisa wasn't aggressive at all with the promotion of their Soundchaser, or any of their other synthesizers for that matter. At least on this side of the pond. They didn't market nearly enough to get me used to putting the words 'Farfisa' and 'synthesizer' together in the same sentence. A quick jump to Farfisa's Wikipedia page confirms that few others string those words together either. The first thing you will notice is the lack of synthesizer information - pretty much all you get is "... and later a series of multi-timbral synthesizers." I took to YouTube to try and find a video of the Soundmaker with some good audio. Turns out video footage of the instrument is almost as rare as the Soundmaker itself. I found one 9+ minute video that includes a very good sound demonstration. Unfortunately the makers of the video decided to get all artsy and make the video black and white, so it can be hard to get a good up-close look at anything in particular. No, wait, that's not even B+W. They seemed to have turned the 'pretentious' knob to eleven and went straight for sepia. Geeez. The first half of the video includes some hand-held camera-work of the internals of the instrument, but Mr. Hands located a tripod for the second half of the video, for some close-up keyboard playing and red hot slider action. Some would say the name of the synthesizer is half the battle when marketing. 'Soundmaker' just doesn't cut it in a world rife in Prophets, Avatars, Chromas, Taurus', and the like. As my GF just joked, why not just call it the 'Shelfsitter'. Okay, maybe I should have stopped after "Never heard of it". The bad weather here is just making me grumpy now. Apologies to all the hard working video creators out there (I do appreciate all the work that goes into producing those videos), to Farfisa, and the Soundmaker in particular. I wonder at what point synth makers realized that including "Honky Tonk Piano" as a preset wasn't going to move that many more units. Glad you liked my Farfisa Soundmaker page.